The Arri Follow Focus MFF-1 is the newest lightweight, single-sided follow focus from ARRI. It is fully adjustable, which allows the unit to be mounted to any camera system with 15 mm lightweight support rods. It can also be supported from 15 mm or 19 mm bridgeplates using standard adapters. A quick-mount design, it can be attached / detached without removing other gear. The unit has two adjustment points for a variety of positioning options and will handle a wide array of lens sizes. The marking disk is beveled for easy viewing of marks over a wide angle, and handwheel can be adjusted vertically for hard to reach setups and support in handheld operation. The focus ring can be set to rotate infinitely, as in a standard unit, or with adjustable hard mechanical stops to limit the focus range. The follow drive unit can also be flipped so that it rotates in the opposite direction (useful when focusing Nikon lenses which rotate the “other way”). 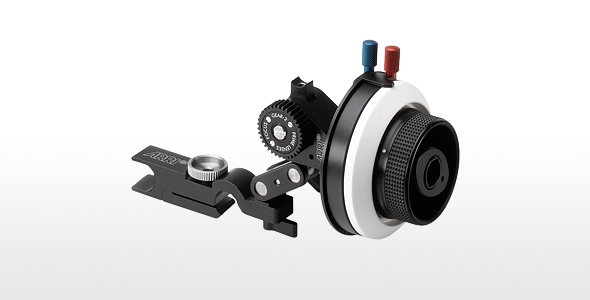 The handwheel accepts standard Arri focus whips and cranks and uses standard Arri focus gears on either side to best fit your lenses. Rent the Arri Follow Focus MFF-1 from DeckHand Camera Rentals Today!